Neil Patrick Harris, with costumed dancers and singers, opened the show with a comic and edgy number "arguing that Broadway, with its con artists, Mormons and nuns this season, is 'not just for gays anymore.'" The song was written by David Javerbaum and Adam Schlesinger. Harris and Hugh Jackman performed another comic number as rival awards-show hosts, and Harris ended the broadcast with a rap-style recap of the show. Performances from nominated musicals included: Catch Me If You Can with Norbert Leo Butz and Aaron Tveit; Sister Act with Patina Miller; The Book of Mormon with Andrew Rannells; The Scottsboro Boys with Joshua Henry; Anything Goes with Sutton Foster; and How to Succeed in Business Without Really Trying with Daniel Radcliffe and John Laroquette. Other musical numbers were performed from Memphis, Spider-Man: Turn Off the Dark, Priscilla Queen of the Desert and Company. 1 2 3 4 5 Pesner, Ben. 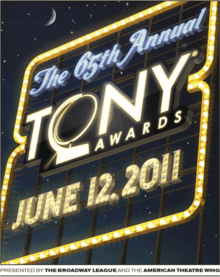 "Dates and Venue Announced for 2011 Tony Awards". TonyAwards.com. Retrieved 10 November 2010. 1 2 Broadway.com Staff. "The Beacon Theatre Will Host the 2011 Tony Awards". Broadway.com. Archived from the original on 13 November 2010. Retrieved 10 November 2010. ↑ "Tony Awards producers choose new home for the show". Associated Press. 10 November 2010. Retrieved 10 November 2010. 1 2 Lyons, Margaret (4 May 2011). "Neil Patrick Harris Will Resume Tony-Hosting Duties This Year". New York Magazine. Retrieved 4 May 2011. 1 2 3 "Tony Award nominees, 2010–11". 2011-05-03. Archived from the original on 10 May 2011. Retrieved 2011-05-03. ↑ O'Neil, Tom (May 24, 2011). "Daniel Radcliffe, Whoopi Goldberg among Tony Awards presenters". Los Angeles Times. Retrieved 24 May 2011.